Trying to juggle a busy job, young family, two houses and occasionally updating this blog can at times prove demanding, which means that by yesterday evening we had only managed to reach page 161 of this year’s Wisden Cricketers’ Almanack despite receiving the parcel containing the sacred tome over ten days ago. This particular article was one we had been especially looking forward to given it was written by one of our fellow bloggers - the excellent and entirely deserving Leg Side Filth aka S A Rennie – being a rather splendid and entertaining review of the year in blogs. So, we poured ourselves a goblet of a rather excellent 2006 Chateau Grand Pontet and settled down to read. Just as we were thinking that “this is rather good”, we got a pleasant and wholly unexpected surprise. Near the bottom of the page was a reference to this blog and our little contretemps last summer with Alviro Petersen, which we at this point should add was amicably resolved a couple of days later. Rennie used it as an example of how even mild criticism of an image conscious cricketer on an obscure (and let's be honest fairly insignificant blog) could provoke a response. 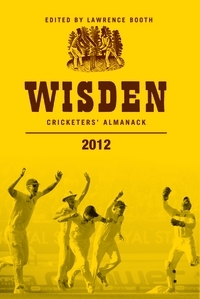 It was only a couple of sentences but there we were in Wisden. It might not rank with scoring a hundred for England in a Ashes series decider – Jonathan Trott does that far better (whatever Bob Willis might say) – but for a micro-second at least, it did impress the long suffering Mrs Reverse Sweep. Those that follow this blog will probably know that The Reverse Sweep clan currently live in the South of France. We've been here for six years, but now is the time with our young son and daughter both under three to return to the UK to have access to a support network and schools. It's available for 675,000 Euros and a full description and a couple of photographs follow below. If you or any friends, family or acquaintances are interested, either send me a direct message on Twitter @thereversesweep, respond in the comments section or use the contact details in the description below. A wonderfully spacious & private villa of 180sqm with 3 double bedrooms including one luxury master suite with ensuite bathroom and dressing area & separate luxury shower room with Italian shower. Separate kitchen, large living room with cathedral ceiling, dining room and mezzanine. Heating & air conditioning is electric, clim reversible. Also a separate independent studio house of 24sqm with ensuite shower room and kitchen. 8x4m Desjoyaux swimming pool with terrace surround. 2850sqm of fully enclosed mature landscaped gardens. Ample outside terraces for dining and entertaining. Electric gates. Automatic sprinkling system. Greenhouse. Close to access for A8 and all local amenities yet very peaceful location. 25 minutes from Cannes, commutable to Antibes/Sophia in 40 minutes and 45 minutes from Nice Airport. Please email sara.harman@gmail.com or phone on +33 (0)6 86 69 09 47 for more information or to arrange a viewing. The Reverse Sweep in The Independent - Fame at last! Well not quite. We can't really call it fame, but we were featured on Saturday in The Independent magazine as part of a piece about prolific purveyors of comment on the Internet. The writer, Rhodri Marsden - who actually has a pretty good article about drawn Tests on his blog - has taken a bit of poetic licence as I only really use 606 to promote my cricket blog, and by no means am even close to being prolific! And I am not skiving from work as the piece infers. No really! Anyway, if you fancy a read click on the link here. I am at the bottom of the piece under the amusing and (some would say!) ironic tag of 'The Expert'. There's even a photo too, which as per my contract was heavily airbrushed. ...well not exactly, but we will be spending the next few days with Mrs Reverse Sweep and the Reverse Sweep babies at our home in the South of France. It is definitely time to put in a bit of quality family time. That means taking a bit of a break from cricket between now and the start of the third test between England and Pakistan next week. It also means we will miss the Finals Day of the FP Twenty 20 competition, but we're sure we'll cope with that. Our only regret being that we won't get to say good riddance to what has been perhaps the most tedious and over-inflated cricket tournament of all time (although the 2003 and 2007 World Cups run it close). In time honoured Blue Peter fashion, there will still be some posts appearing on the blog every day that we prepared earlier. Mostly these will be one of our Heroes or Zeroes, but also the 17th August will see the start of a new feature on the Ashes. Enjoy and ciao for now. When we first started writing about cricket, we posted regular articles on World Cricket Watch (we recommend checking out the new WCW One Hand, One Bounce weekly podcast by the way) and Pongo Cricket. This included our regular weekly column entitled 'The Reverse Sweep' (hence the name of our blog, which we created a few months later). The name came from the fact that we aimed to take an alternative and irreverent take on the big stories in cricket. Hopefully, we've achieved that in a small way. Anyway, whilst we've continued to post the column on World Cricket Watch (read past issues of The Reverse Sweep here), we haven't posted it on Pongo. That wasn't a deliberate move, but in the main due to the trials and tribulations involved in becoming a father for the second time. We also saw that the number of people posting blogs on Pongo had dried up. But this week, we've decided to redress the issue and have posted the latest column on Pongo as well as World Cricket Watch (once David uploads it to the site!). This week's column features a preview of the England-Pakistan test series, which kicks off tomorrow at Trent Bridge. We also take a look at the mounting problems facing Australia ahead of the Ashes, suggest the teams that should be involved in the next MCC Spirit of Cricket Series, take a potshot at the run laden Colombo SSC pitch and ask what has happened to India's fast bowlers. If that sounds up your street, head over to Pongo and/or World Cricket Watch and give it a read. Today is a momentous event in the Reverse Sweep household. It sees the birth of our second child - a daughter which, God willing, will be taking place right about now. How do we know you may ask? Well just like our son, little Reverse Sweep is a big baby, so the doctors have advised a cesarean birth. So we knew in advance that today was the day. That certainly helps our blogging, as this means we can plan some posts in advance. Hence, the All-Time England XI series and other goodies coming up over the next few days whilst the Reverse Sweep himself is changing nappies. We thought it would be fun to see which cricketers were born on 17 June. As an English household, we were delighted to see that one of England's greatest Brian Statham (pictured) was born on this day in 1930. We were also pleased that Surrey and England keeper Steven Davies was also born on this day in 1986 He is going to have some battle with Craig Kieswetter and Matt Prior over the coming years for the England wicketkeeper's spot. Outside cricket, a host of people in history were born on 17 June. Some we were pleased with like Edward I of England (1239), tennis star Venus Williams (1980), composer Igor Stravinsky (1882) and crooner Dean Martin (1917). Others are not so good like "singer" Barry Manilow (1943), former London Mayor Ken Livingstone (1945) and Nazi Martin Bormann (1900). Back to cricket and in Australia the little known Alec Hurwood, who played just two tests was born on this day in 1902. But it was the identity of another Australian cricketer born on 17 June that provoked dismay in the Reverse Sweep household - our favourite figure of hate Shane Watson. But we are not going to let that spoil our day! Imagine our delight when we logged onto The Times website this morning, navigated our way to Cricket Central and found that our humble blog had been included as one of the 50 best cricket websites in the World. Indeed, we are happier than Yuvraj Singh would be having stumbled upon the World's biggest naan bread. Happy days. Now it is time to prepare that speech! The new English domestic cricket season kicks into full swing today with the first round of county championship matches. It does so under the shadow of an IPL season approaching an exciting conclusion. And as it casts envious eyes towards the sub-continent, English cricket knows that its nouveau riche Indian cousin is here to stay; they only need to look at the attendances and viewing figures on ITV4 to realise that. We at the Reverse Sweep must be in doomsday mode at the moment, as this week's column on World Cricket Watch leads on our belief that the county system is in urgent need of reform. This is the theme we have taken even further with our most recent article on CricDude called Envy and the need for reform. Please read the articles and let us know what you think? Do you agree, and if so what would you do? If you disagree, please tell us why and we may write a follow-up article to offer a more balanced view and hopefully prompt further discussion.